This month is rich on Joomla happenings and great national events are on their way. German and Polish community will hold the events we'd like to talk about below. JoomlaDay Germany will be held at 17-18th of September in Hamburg - the second largest city in Germany known as free and Hanseatic city of Hamburg. This significant event will unite all active members of German Joomla community and show its stength: during two days sessions and presentations from different speakers will be introduced to the auditory. RoundTheme representative Eugene Sivokon (he is also a part of NorrNext) is honored to speak at the event and will introduce his session called Building a Joomla club: goals, problems, solutions. Eugene will consider all aspects of building a Joomla club as template or extension provider: reasons, benefits of work in a team, nuances of team management, how to get investments, the process of building an infrastructure, marketing research and finally promotion. Every interested person is welcomed to come at this session. 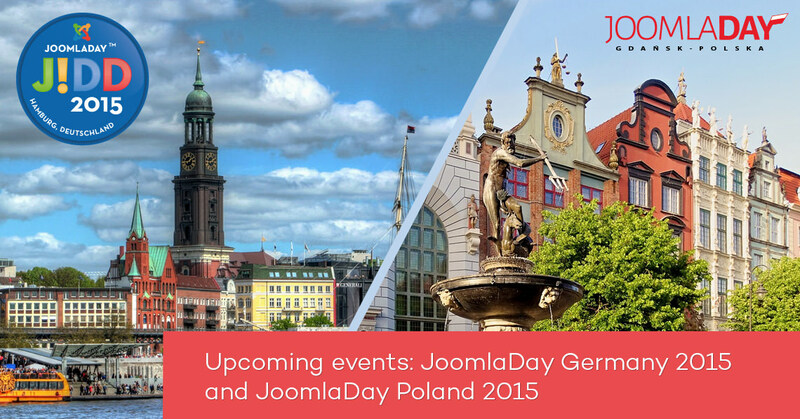 Another event is awaiting: JoomlaDay Poland to take place at 26-27th of September, 2015 in Gdansk - the city of freedom. Polish Joomla community shows great success in consolidation and coordination between various JUGs, so this is a key-event that will took 2 days of rich program introduced by speakers as from local community, so by persons from the rest of the world. Eugene is happy to speak there with another session called Effective Team building for Extension development. We'll speak about product development inside a team - how to manage the processes of development and work with a team, how to prepare product and meet high standards that will let to introduce the product on international market. I'd like to invite all interested persons from Germany and Poland to come to these events to have a great time with other Joomla devoted persons!